Having a bird as one’s amusement is an exciting hobby. Unlike adopting mammals, adopting bird will make you learn things such as how to take care cockatoo or train cockatiel to sing as interesting challenges. Cockatiel is known to mimic tune well. Moreover, it has the intelligence to mimic human’s tune too. That is why many bird lovers like to adapt and train cockatiel. If it is your first time dealing with cockatiel and you want it to sing, there are some simple steps to train your pet cockatiel singing fluently. Follow these steps below as you begin training your cockatiel. The first step training your cockatiel to sing is by introducing it some tunes. While bird has natural vocal abilities, not all of them can carry a tune. Therefore, the first step for them to sing is by whistling aloud few tunes that you know. For example, you can choose a song and whistle the chorus. Make sure your cockatiel is nearby so it will be able to hear your whistling. You need to do it repeatedly as cockatiel tends to record sound based on repetition. Eventually, your bird will start to sing the tune you introduced to them. Similar to the first step, play a song from speaker every day. For the start, play instrumental song with simple tune. This is to check if your cockatiel can really carry a tune or not. Playing a song with complicated tunes for a cockatiel that has never sung before will only confuse it. As for the duration of the song, it is better to put the music on loop with fading effect. The gap of time between the loops will help your cockatiel to remember a tune. Moreover, you will need to play the song in an area where your cockatiel’s hearing works well. When cockatiel fails to carry a tune, it does not mean they have no vocal abilities. They may still able to mimic normal talking’s voice. To do so, start by talking to it every morning or whenever you have time. 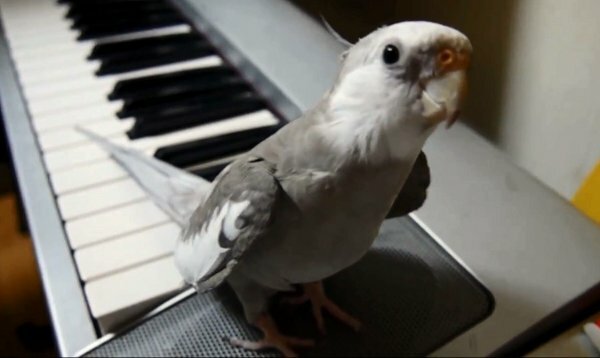 Even though you talk in normal manner, for cockatiel human’s voice is still a set of tunes it needs to learn. Not only it will make your cockatiel less hesitant to produce sound, talking to your bird will also strengthen the bond between an owner and a pet and get closer to your pet bird. Your cockatiel usually will pick up a word that you often use. You can also learn to get closer to bird of paradise for your other collection of bird. Unlike parrot, cockatiel has a more gentle nature and pick up notes quickly. They are also able to understand context, only if the owners teach them. In order for them to pick up words with context, try to say few words during a certain situation. For example, say “see you later” or “goodbye” before leaving and say greetings whenever you come back home. By doing this, your cockatiel will get used to talking and will find it easier to learn singing. Repetition is the key for your cockatiel to utilize their vocal ability. However, if it is done inconsistently, it is unlikely that your bird will learn anything. For instance, you devote 30 minutes worth of training, only to abandon it the next day without any schedule. No matter how much time you invest in a day, if it is inconsistent, it will not work. Therefore, set up training schedule with regular time and duration. Devote at least ten minutes a day when you can fully train your cockatiel. Do it every day with the exact same time and pace. If it works, your cockatiel may be able to sing some tunes. Training also work for other animal such as how to train cat to obey your command . Not only you should pay attention to its external ability to sing, you will also need to focus on the nutrition needed by your pet. Some birds losing the ability to produce sound do to their vocal chords getting damaged. Thus, give nutritious food that contains a lot of water, fat-free and oil-free as well as avoid giving processed food with a lot preservative in it. An addition of vegetable and fruit in fresh condition and clean water that you change every day will boost your cockatiel’s vitality and improve the health of its vocal chords. Consult with a veterinarian if needed to determine the best diet for your beloved cockatiel. You will also need to know how to take care of sick bird. Pet, especially birds love getting praises from their master. If you keep training your cockatiel to sing without acknowledging however small the progress is, the bird may stop trying and no advancement on its talent will happen. This is why praising your cockatiel can help to boost its confidence. Praise and acknowledge your cockatiel whenever it produces a sound or mimic a tune by saying “Good job” or “Well done” genuinely. Even though cockatiel is an animal, its attachment to its master will make them appreciate any acknowledgement given to it. There is also a research to translate animal language that helps to communicate you with your pet. Cockatiel can get distracted while training when there are toys and foods in their cage. While you teach it by whistling, your beloved bird may too busy to deal with all the distraction, resulting in your bird failing to sing. To make sure there is no unnecessary distraction from, remove toys and food and make a room in your cockatiel’s cage so it will focus on your training. Whistle a couple of times to get its attention. If you cannot whistle, play a song instead and repeat this process regularly. Note that it is easier to train young and male cockatiel since they tend to sing more often to show courtship more often than female. Even though it is still possible for the female one to sing, it will require more time and patience. Thus, if you specifically want a cockatiel that you can apply simple steps to train your pet cockatiel singing fluently, choose a young male cockatiel instead. You may also want to know about exotic bird like bondol eagle and learn to get closer with eagle bondol.